There have been a number of attempts by bikers, skateboarders, and the like to jump the Great Wall. Extreme athlete Travis Pistrana even tackled the challenge on a toy bike. Sadly, not every attempt has been successful. Two Chinese BMX riders were looking to fly over the wall to celebrate a national holiday. One landed safely in the area set up to catch the falling stuntmen, but the other flew right over it to his death. So much for home field advantage! Most little sippers, like the Sip Advisor, probably don’t follow the sport of free running. It’s basically akin to parkour, but involves more theatrics… wait, there can be even more acrobatics thrown in? World renowned free runner (you can be renowned in this field? ), Ryan Doyle put the Great Wall in its place as part of his Red Bull World Wonders Tour. Remember, Red Bull: It gives you wings… and hopefully not because you’re dead and on your way to the afterlife. In perhaps one of the cheesiest special effects of all-time, Superman used laser vision to repair the Great Wall after it had been damaged by the equally cheesy villain, Nuclear Man (before The Simpsons Radioactive Man). This all came about in Superman IV: The Quest for Peace, which effectively killed the movie franchise. I’ve never been a Superman fan, but I have to give him credit for fixing a landmark I have yet to see. In 2005, a number of acts gathered for a concert using the Great Wall setting as a backdrop. Headlined by Boyz II Men, other performers included Cyndi Lauper and Alicia Keys. The show was recorded for a DVD release, The Great Wall Concert (I’m blown away they couldn’t come up with a more glitzy name than that), and also included interviews with historians, visits to other Chinese landmarks, and comedy performances on the streets of Beijing. There has been some amazing feats performed in the world of magic and David Copperfield’s act of walking through the Great Wall has to be among them. What else would you expect from the same man who has levitated above the Grand Canyon, made the Statue of Liberty disappear, and wed Claudia Schiffer!? For this illusion, Copperfield used a sheet and his faithful assistant to appear to go through the legendary wall… his secret is safe with me! Chinese acrobat Adili Wuxor (dubbed the ‘Prince of Tightrope Walking’) and his apprentice Yakup Jang performed a tightrope walk of 1,100 feet from one point of the Great Wall to another in 2013. It’s estimated that the duo was 328-feet above the ground at the highest point. If that wasn’t enough, the stuntmen performed some theatrics during the 40-minute crossing, including sitting on the rope, balancing on one foot, dancing, and even going blindfolded. While it has yet to happen in a Bond film, it has long been rumoured and researched to film a motorcycle chase scene at the Great Wall for the long running franchise. First dreamt up for the 1989 License to Kill, negotiations with the Chinese government hit a snag when the politicians asked for power over the script. The most recent 007 saga, Skyfall, was to include the fabled act, but plans changed and although Bond travels to China, the Great Wall was not used. 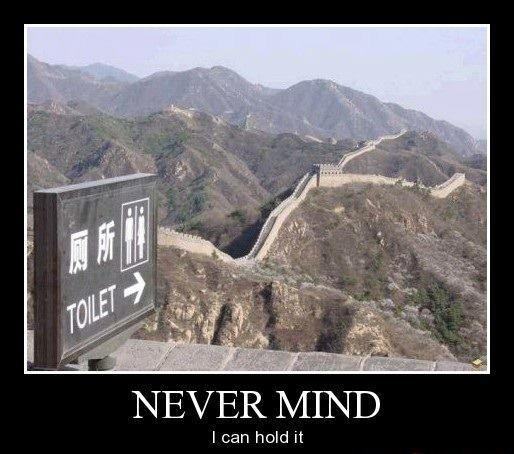 I’m proud of all you little sippers for traversing the Great Wall with me and not needing to be carried by bodyguards like that twerp (nee douche bag) Justin Bieber. Now that was an amazing feat… of stupidity! Some say Chu Yeh Ching Chiew is similar to wine, others to gin, and some classify it as closer to vodka. One site calls it Chinese Bamboo Leaf Vodka and that’s good enough for me! What really matters is that it’s believed to cure hangovers… well, at least for you hangover prone little sippers out there. 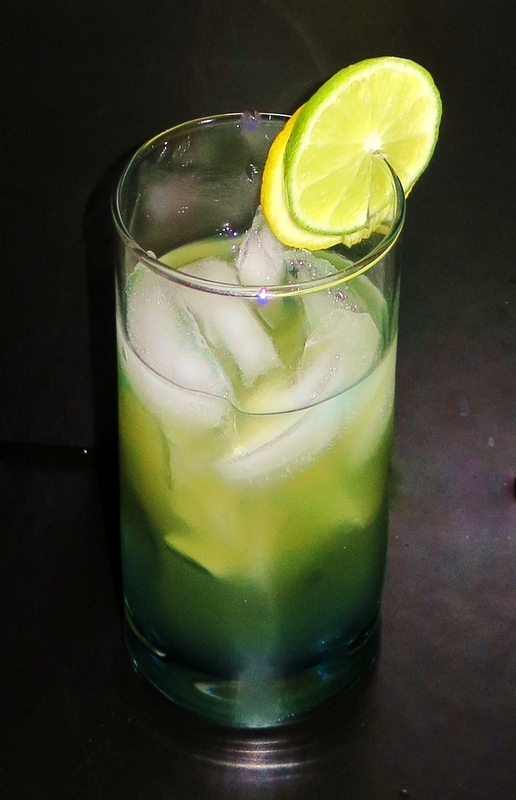 As for this cocktail, it’s not bad. The flavour is indescribable thanks to the mix of Chu Yeh Ching Chiew and Lychee Juice; two flavours I don’t know very well. It could use some fizz, however. This entry was posted in Crazy & Classic Cocktails and tagged 007, Adili Wuxor, Alicia Keys, Beijing, Biking, blue curacao, Boyz II Men, China, China Blue, Chinese Government, Chu Yeh Ching Chiew, Claudia Schiffer, cocktail, Cycling, Cyndi Lauper, David Copperfield, Free Running, Grand Canyon, grapefruit juice, Great Wall, Great Wall of China, james bond, Justin Bieber, Kevin Foster, lemon wheel, License to Kill, lime wheel, Lychee Juice, Nuclear Man, Parkour, Prince of Tightrope Walking, Radioactive Man, Red Bull, Ryan Doyle, Skateboarding, Skyfall, Statue of Liberty, Stupidity, Superman, Superman IV, The Great Wall Concert, The Quest for Peace, Travis Pistrana, World Heritage Site, World Wonders Tour, Yakup Jang by Daniel Wilson. Bookmark the permalink.